Should you buy a Mercedes-Benz S550 today? “Yes.” It’s a totally new luxury sedan that delivers a lot more car for less money than its predecessor. Now in its ninth generation, the S-Class is a leap forward in all aspects. Competition and a less reliable previous edition forced the three-pointed star manufacturer to deliver a strong contender for the top of its class. Start with a sharp design emphasizing a muscular stance above and beyond a simple luxury ride. Add to it a compilation of beautifully handcrafted materials inside and perhaps a more austere dashboard than expected. Then throw in all the passive and active safety systems you could imagine and a satisfying high-performance powerplant, and it might be difficult to assign any other grade than the top one. It is often said that less is more, and that’s exactly what Mercedes’ new COMAND (Cockpit Management and Data) System strives to accomplish. Featuring a mouse-like input device and LCD multi-purpose screen, the system has a learning curve but definitely becomes more user-friendly over time. The device controls everything on the car from navigation to the seat massagers. COMAND also frees the dash of the countless buttons indicative of such a technologically complex car, contributing to its artful design with glossy wood and aluminum knobs. In a way it reminds us of the Grand Mercedes-Benz 600 of the 1970s enjoyed by so many VIPs and heads of state. Once inside, get the seat to the desired temperature, find the massage feature, switch on the capable 600-watt Harman/Kardon Logic 7 Infotainment PC-card sound system, set the smart Distronic Plus cruise control and drive safely into the sunset with the aid of the optional Night View Assist infrared system. 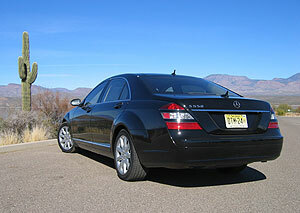 For those concerned with ayurvedic health practices that discourage contact with cold air, S-Class engineers designed the massaging heated and cooled seats to provide room temperature circulation rather than simply blowing frigid air conditioning at your posterior. These same seats are also manufactured from environmentally friendly materials. 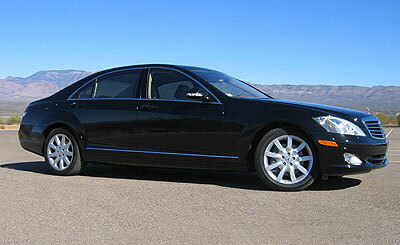 Mercedes-Benz is trying to please rich performance demons with the S600, which features a twin-turbo 5.5-liter V12. If that doesn’t satisfy your insatiable lust for thrust, and you have patience and lots of extra cash to burn, wait for the release of the $180,000 S65 AMG, which churns out more than 600 horsepower. Those who need additional traction can order an S with 4Matic all-wheel drive. Our tester came with the standard Airmatic suspension with dual modes: Comfort and Sport. We expect most of the driving to be accomplished in the former mode, though. With all of these ingenious attributes and sumptuous luxury features, you might never want to get out of this car. The only reason we did is that it wasn’t ours to keep. The S-Class is nothing short of revolutionary. Click here to learn more about its technological advancements.